As usual, a bit overdue for a My Life post. Once again went up to Fukushima (Kumi's hometown) for New Year's, and once again I had to put up with winter temperatures both outdoors and indoors. I just don't understand how people managed to live in Northern countries before central heating was invented, but staying in Kumi's parents house gives one a great opportunity to find out. People survive by putting little gas-powered stoves around a room. I say 'a' room because usually only the living room/kitchen has them. Things like showering, sleeping, and going to the washroom are all done in igloo like conditions. 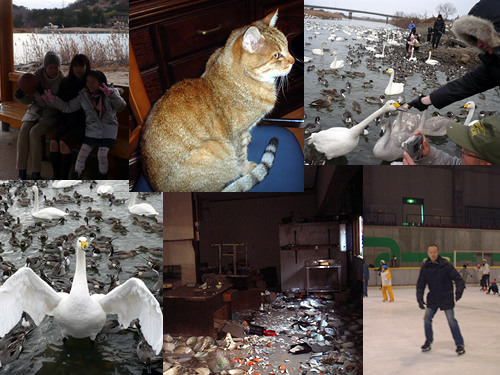 However, besides never being warm, we had lots of great adventures like going skating (I can still skate after an 8 year hiatus), going back to the swan/duck sanctuary, hanging out with Tora the cat and Kumi's family, etc. We even went on a little haikyo adventure to an abandoned theme park once known as 'Green Land'. Good times. Japanese garbage probably deserves a post all to itself, but I'll stick it here for now. The good ol' days of the 80's bubble economy when people threw out brand new TVs, stereos and refrigerators are pretty much over, but now and then you'll still find a gem or two in Tokyo's trash. 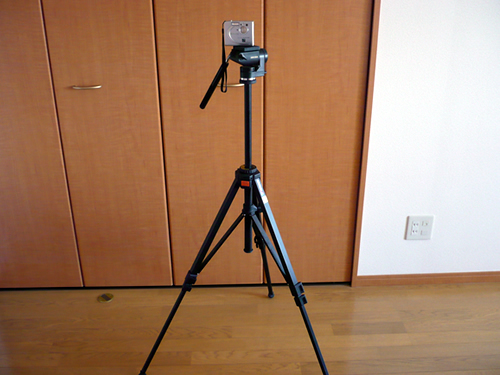 For instance, a week ago I found this great camera tripod just sitting in the garbage area of my apartment building, nothing at all wrong with it. This kind of thing harks back to the times when people threw perfectly good things out not because they're broken, but because they bought a better (meaning more expensive) one. Me? I'm not proud. For example a few years ago when cash was hard to find, I furnished half of my apartment with shelves, tables, chairs and mirrors found lying out on the street. So now it would be nice if I had a decent camera to go along with my tripod as my little digital one looks a bit silly sitting on top of it. However, finding a Canon EOS Rebel XSi sitting in the garbage is probably a bit much to hope for. Funny to think that years back I was a staunch anti-coffee advocate. Hated it, never drank it, etc., etc. Now the pendulum has swung the other way completely and I'm a confirmed coffee lover. I'm not just a coffee lover though, I'm a good coffee lover. Don't bother me with those instant coffee mixes or those damn cans of coffee sold in vending machines, I only drink coffee of the highest quality. So it is with great pleasure that I use my new, expensive coffee/espresso maker. I got it for Kumi for christmas, but don't tell her how much I love it, she might get suspicious. Of course she loves coffee too, she's the one that got me on to it actually. 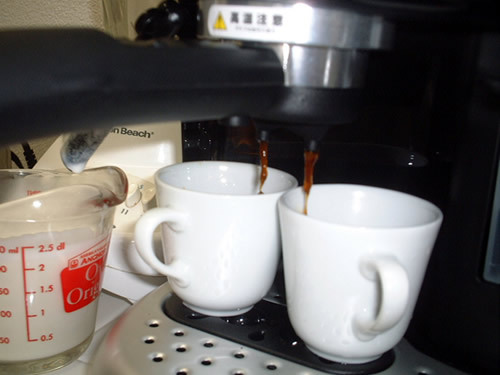 The machine is the first step, but the coffee beans have to be great as well, and right now I recommend Dean and Deluca's selection, but only because I haven't had time to sample a wider variety. Favourite beverage? Cappuccino! Mike's blender has been replaced! 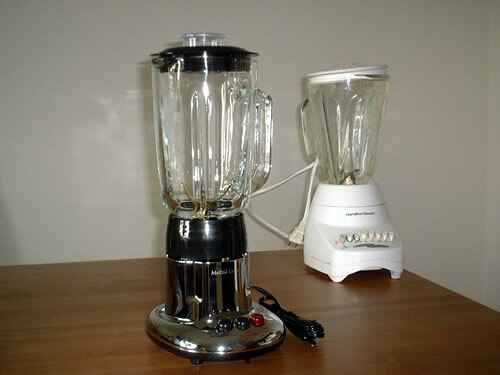 No, no, I mean my actual blender has been replaced, not the site. Anyway yes, a day of both joy and sorrow as we usher in the new and say goodbye to the old. Say hello to my snazzy new Tescom model who will be taking over blending duties from now on. My old Hamilton Beach blender has served me faithfully and well, but after blending some thousands of banana-blueberry milkshakes, it's become somewhat grotty, smelly and permanently stained. It's been with me since even before this website went up though, I received it way back in 2001 in Canada as a Christmas gift, and it was the reason this site got named what it did, so a little respect is in order! Now I have to decide whether to have it bronzed or just leave it in the trash area of my building. After finishing my third year of teaching highschool, I swore to myself that I'd never do it again. The last two years weren't pretty, but this year was like plunging into the depths of hell. There was this one class in particular.... During class time the students would regularly sleep, eat, drink, talk, listen to music, use their mobile phones, play cards, play their PSPs, play their Nintendo DSs, walk around, fight with and shout obsenities at the Japanese teacher working with me, etc. Now you might think that I could've done something to try to stop it. I could've tried shouting at them, I could've tried to reason, I could've tried begging, or even hitting them, etc. But none of that would've worked. How do I know? Because the Japanese teacher tried all these things and invariably got one reaction: Laughter. And by laughter I mean the cruel, 'you're an idiot' kind of laughter. Ahh, the good old Japanese education system where the teacher has as much power as a worm trying to control a raging mob. Anyway third year's the charm and I'm finally outta there! 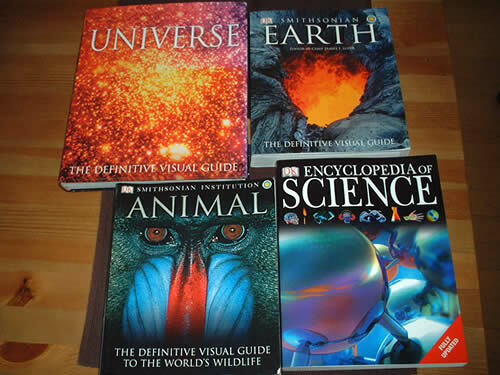 When I was a kid I used to spend hours reading and looking through these old encyclopedia-like books my dad had about dinosaurs, chemistry, astronomy, nature, and other science-like stuff. Since leaving Japan I've always missed having books like that around, interesting stuff you can leaf through on a rainy day, etc, so I decided to go about gathering my own set. I've managed to collect four so far, all done up by the Smithsonian Institution. They are, in order of having bought them: Universe (astronomy and physics), Animal (animals and biospheres), Earth (geology, geography, meteorology) and Science (mostly chemistry, biology). The first three are really good, with great photos and interesting, up-to-date information, but the Science one seems to be made for kids, and the diagrams are just awful. There is one more in the set I plan to get called Human, and then all I'll need is one about dinosaurs and it'll be just like the old days. My sister's been busy making all these amazing cakes, so I thought I'd give cake making a try to see if it runs in the family. At the least, I should be able to do better than my buddy Scott here, who obviously has no cake making genes in him. No pre-mixed cake packages for me, I wanted to make the whole thing from scratch. 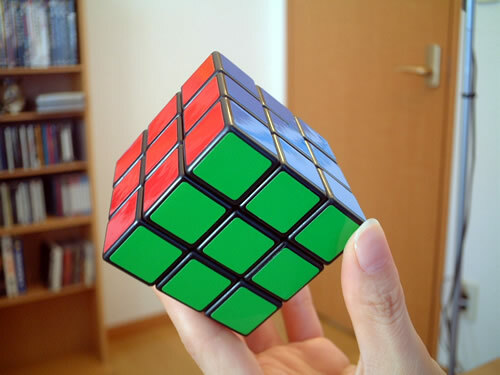 My goal? 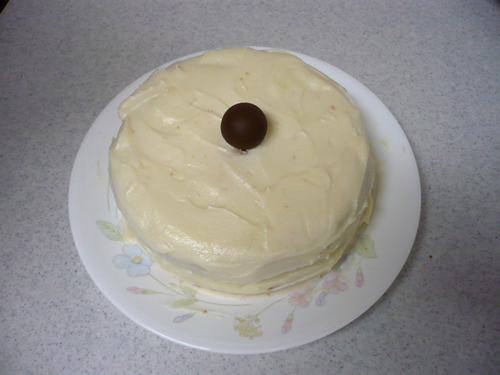 To make a cake that looked and tasted as good as a Loblaws cake, my absolute favourite. After years of riding Alex's old mountain bike into the ground, it was on it's last legs. It was dirty, the chain was rusty, the tires no longer held any air in them, pieces were falling off... you get the picture. It was time for a new bike!! 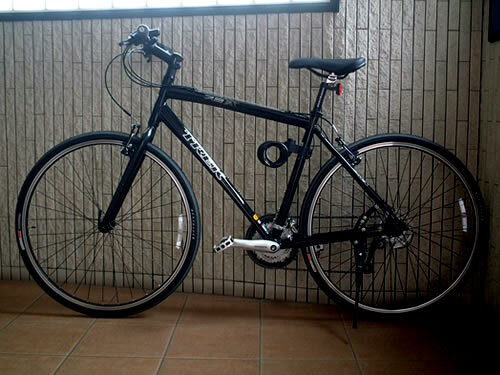 Following in the footsteps of Jason, who bought a blue Trek 7.3, and then Mike who bought a white Trek 7.3, I went out and bought a black Trek 7.3. Peer pressure is a funny thing isn't it? Whoever wishes to follow in the steps of greatness, there is still a red Trek 7.3 yet to be bought. Maybe Scott will get it when he returns from Australia? With four Treks we'll be able to merge together into one giant robot: Cyclotron, to battle evil. 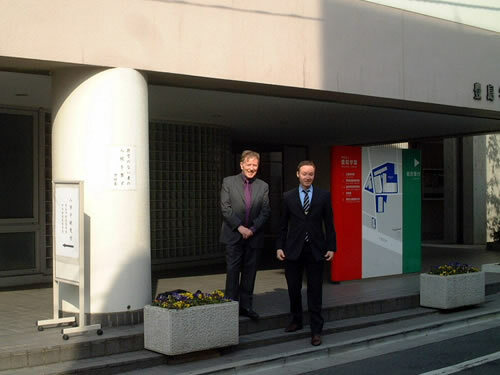 In the meantime though, I'm looking forward to getting out on Tokyo's best bike paths, and doing some cyclo-camping with Mike and Jason.